Visit the demo or a large view. The upper area contains a slider where you can place extra emphasis on your most important pages. The main area can include the content of your latest blog posts. On the right side you’ll find an overview of latest blog entries as well as the latest tweets. The upper area of the sidebar features five latest comments. You can place any widget under it as it is defined as a dynamic sidebar. Also, right above the footer you’ll find a Flickr gallery in case you wish to showcase your latest shots. The footer itself is designed in a pronounced blue, giving it a nice contrast to the rest of the design. There you you can place your widgets such as Pages, Categories, Archives, and others. A soft upper area, a useful middle area, and a strong footer are the essence of this theme. Thank you, DesignDisease! We sincerely appreciate your work and your good intentions. 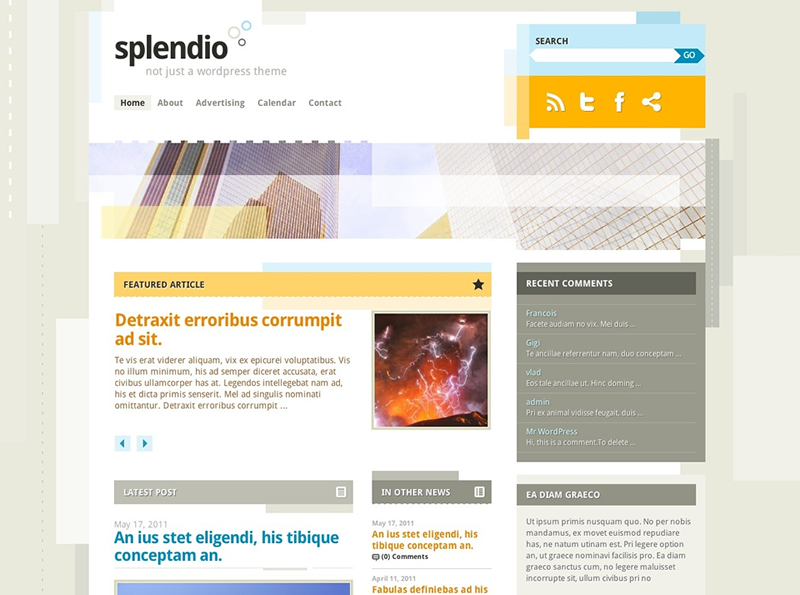 Really excellent looking theme, plan to use Splendido theme on some sites. Great work DesignDisease! Awesome Template, I write some Words about it in my Blogzine! It’s a very interesting design and works well as a stand alone experiment, but it’s going to be difficult to put to any practical use in terms of modification given the extensive use of graphics. I’d love to see Design Disease tackle a minimalist, functional and adaptable design for Smashing Mag. First of all, very nice template! But i have on elittle problem withe the template. When i use it the blue footer section isnt shown. Must i change something in the preferences or in a file. If so please tell me where because i cant find anything! Thank you very much for this theme! One question: How can I change the language into dutch for all the elements? I want to try download it friend. Can I? Great template! Just a question: how do I set a featured post? This is a great and nice theme! Very beautiful! Can you please let me know your URL to find out what’s wrong? It’s a very interesting design and works well as a stand alone experiment, Really excellent looking theme, plan to use Splendido theme on some sites. Great work DesignDisease! THis is very useful us. I will suggest to everyone about this DesignDisease of Logos. I cannot see the slider or flickr gallery function… not sure what the problem is. Would be great to get some help! Hello, love the theme but as soon as I add a post the sidebar is pushed to the bottom and the background wrapper dissappears completely (see URL above). Is it something I’m doing wrong? Or maybe its WP3.2 that is the problem? Please help. Thank you! Thanks for a great and clean theme…but where is the documentation/install instructions? sorry I looked, but cant find. Hi! I am having problem with the, Splendio theme installed into the new version (3.2). The slider seems to be not correct. The width is overlapping the sidebar. I try to fix it but I can’t find the source of the problem. sorry my bad, I didnt see the option. :D fixed it already! Thanks for that great theme, that’s exactly what I was looking for! I have a slight problem with the slider though, I can’t manage to see it… and I haven’t found any option or anything in the settings, how do I enable it ? I checked the box to feature the article when I wrote it, but then it doesn’t appear on my webpage, maybye I missed something? Thanks for this really top looking theme! 2 Qs – how does one get the ‘featured post’ to work? – is there some way of making the images in the ‘latest post’ smaller when it’s on the front page? When they are 600 wide in individual post pages, they are great, but the ‘recent posts’ tends to run over the top on the front page.. I have a problem with the Featured Article. It doesn’t included very well in its part. Text go out , picture doesn’t take its place on right… there is an outline for this ”dynamic article” . Have you an idea about this problem? Thanks you very much for this them. it very nice and useful for me. thanks again. Thanks for a great and clean theme’¦but where is the documentation/install instructions? sorry I looked, but cant find. Thank you very much for that awesome theme. I use it on my private blog and website and wrote some credits in german (http://www.martin-trauth.org/medien/das-splendio-wordpress-theme/). splendio is a very nice theme but i don’t see the botton “older” (posts); for example if i have 30 posts, in my page i can see only few posts, we say 10, and the others 20 posts? This blog is very most important to us. Excellent template and it looks professional. Great! Very nice theme. I am currently using this theme on one of my sites. Great work! Beautifully coded and designed template! One of the few templates I’ve enjoyed right out of the box. I was able to quickly customize the few things I wanted to personalize….but…I did have one question. Q. There is a large white space between the main content and the footer/Flickr stream. Which CSS class manages this margin? Lost the fade out hover feature. Any clues? But, I wonder why on my site the page numbers are not active and how to display older entries like your evidence theme? … manually hitting the older page link displays the same page as the homepage. Okay no problem, I did it. Thanks anyway! Fantastic theme, congratulations and thanks for share it! Planning to use it soon in a new project. I have a question regarding the images and small icons displayed throughout the template. Do you do those images, figures, icons with a software such as photoshop or do you just get them from the internet? from like a free public image database online? This is a nice template and I have a question regarding the images and small icons displayed throughout the template. Do you do those images, figures, icons with a software such as photoshop or do you just get them from the internet? from like a free public image database online? I want multiple posts on the first page. How can I manage that? I’ve installed the pagenavi plugin, but I’m not seeing it. For the rest: awesome template!! OK, I managed to change post_per_page into what I want. I see no page navigation though. And how to get a featured post? That is Beautifully designed template! I love the tamplet. How can i download it?